A collaborative team of researchers from Shinshu University in Japan has found a new way to curb some of the potential dangers posed by lithium ion batteries. The researchers, led by Susumu Arai, a professor at Shinshu University, published their results recently in Physical Chemistry Chemical Physics. Lithium ion batteries, typically used in electric vehicles and smart grids, are key to a low-carbon future, according the authors. The problem is that while lithium could theoretically conduct electricity at high capacity, it also results in what is known as thermal runaway during the charge and discharge cycle. "Lithium metal is inherently unsuitable for use in rechargeable batteries due to posing certain safety risks," said Arai. "Repeated lithium deposition/dissolution during charge/discharge can cause serious accidents due to the deposition of lithium dendrites that penetrate the separator and induce internal short-circuiting." As the need for batteries capable of more energy capacity increases, the need for more secure storage within the battery also becomes critical. Lithium dendrites, named after their biological brethren, branch from a main source and send electrical impulses at locations that may not be secured. "A number of approaches have been developed to prevent the growth of lithium dendrites that are complicated and have some problems," said Masahrio Shimizu, an assistant professor and the paper's first author "In contrast, our strategy of adding magnesium salt is extremely simple." The researchers introduced a type of magnesium salt capable of combining with lithium to stop dendritic branching. It worked, but they found it difficult to reverse, which is necessary in rechargable batteries. 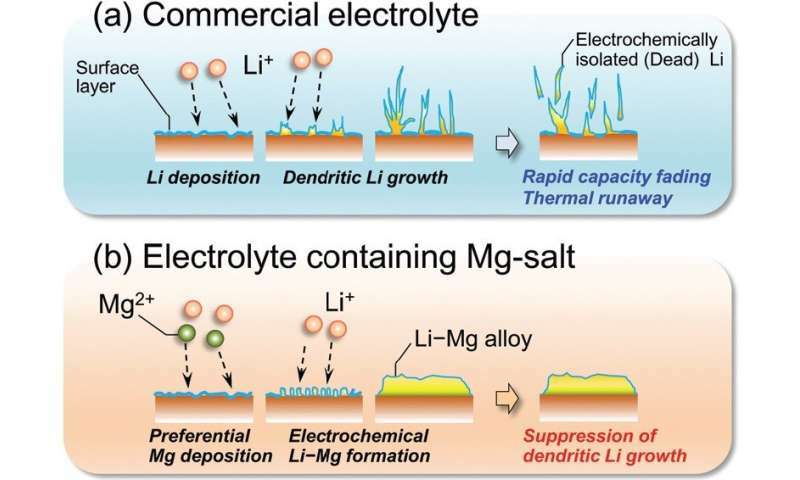 Now, the researchers are studying the benefits of other types of magnesium salts, as well as working to improve the electrochemical stability of the salt combined with lithium to make reversal easier. The researchers hope to solve the issues with this plating technology and eventually achieve a compact and high-capacity battery. "We aim to show the significantly improved reversibility of lithium deposition/dissolution and to realize stable operation for at least 1,000 cycles," said Arai. "The ultimate goal is to create batteries to run for 500 kilometers with full charge in electric vehicles."